I find it incredibly snicker-inducing* that, following Condoleezza Rice's criticism of his government before Congress, Iraqi Prime Minister Nouri al-Maliki retorted with the following: "Such statements give moral boosts to the terrorists." So you're saying criticism of your government helps the enemy, eh? 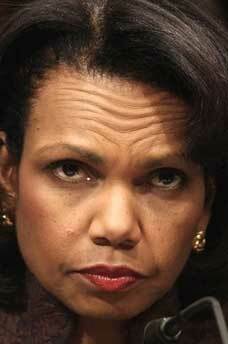 Ms. Rice, that medicine must taste terribly familiar. *Because if you can't snicker at international armageddon, what can you snicker at? Photo courtesy of Princess Sparkle Pony, my go-to repository for goofy Condi photos. Jon Stewart's "seducing" of Condi on The Daily Show was treeeeemendous. So tremendous, that I saved it to the TiVo for later viewing. Anytime Jon Stewart says the word "spermatozoa" in something that has to do with Condi, I think I have to TiVo it. Next he'll go into how they have to fight them over there (Iran) so they won't have to fight them over here (Iraq), dontcha think?